Fourteen schools and communities turned up to mark the event which occupied the whole of the day. Several schools were not able to attend the event due to their end of the year programs but organisers were happy with the turnout. Children ranging from 7 years old to 12 years old had a fun-filled day of football with the enjoyment also extending to the teachers who came out to supervise them. The program opened with speeches from the Solomon Islands Football Federation (SIFF) president, Martin Alufurai, the Third Secretary to the Australian High Commission, William Ewing, and Benedict Esibaea, the Director of Primary Education in the Ministry of Education and Human Resource Development. 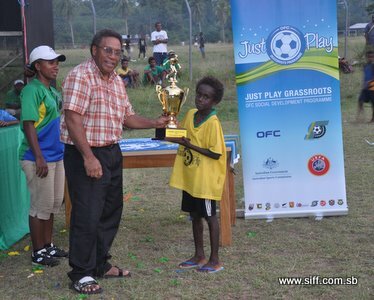 Esibaea offered the national government’s word of appreciation to the Australia government, the Oceania Football Confederation and SIFF for the Just Play program in his speech and he challenged the children to become the sports men and women of tomorrow. “My minister appreciates the impact that Just Play has made in Solomon Islands not only in Honiara but also in the provinces. We extend out gratitude to the Australian government and OFC for supporting this program. I also wish to thank SIFF for the leadership and the hard work you have shown in developing this program,” Esibaea said. The highlights of the day were 2 football competitions which saw 23 teams compete. Eleven teams competed in the Under-10 category and another twelve competed in the Under-12 category. Matches kicked off at 10:00am in the morning and continued throughout the day until late in the afternoon. Only the finals of the Under-10 category were completed yesterday with Naha Seventh Day Adventist Primary School taking the winner’s trophy after they won the grand final 4-2 on penalties. The finals of the Under-12 category will take place this afternoon and the presentation of trophies will follow right after. SIFF special projects manager, Phillip Ohoto’ona, organised the event in collaboration with other departments in SIFF and he was satisfied that the event was a success. “For me what is important is that the kids enjoyed the event and from what I observed I think a lot of that was achieved. It was great opportunity for my office to give the kids a chance to express themselves on the pitch and at the end of the day I became the one who was totally awestruck about the enthusiasm and the talent that I witnessed,” Ohoto’ona said. In his closing remarks Ohoto’ona thanked the teachers and students, volunteers and partners for making the day a success. Similar Just Play days are planned for other regions of the country when they completed their 6-week implementation programs. The next region that will host the Just Play day is Marovo in the Western Province. Their Just Play day is likely to take place in the third month of next year. The Just Play program is an Oceania Football Confederation (OFC) social responsibility program that aims to promote social issues through football and targets health as one of its main objectives. It is funded by the Australian government and is active in other OFC member countries including Papua New Guinea and Tonga.